We recently found PuffinPaper - a waterproof paper that we like better than any other. You can write on it in any weather or climate and print on it with laser printers, inkjet printers or plain-paper copiers. In addition to being waterproof, PuffinPaper is tear resistant, abrasion resistant, puncture resistant and all-around durable. We think that it will become your favorite paper too. Our waterproof and all-weather notebooks will keep you prepared to take notes anytime, anywhere, and in any weather. We have a variety of notebooks, pens, pencils, and field desks - all designed for outdoor writing. They work perfectly indoors too! Carry one in your pocket, purse, backpack, camera case, or the dash of your car. Quick notes and sketches can be valuable records of your observations. 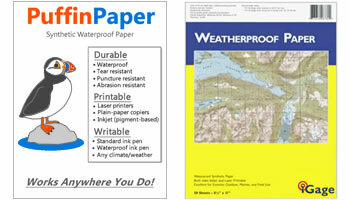 Our waterproof and all-weather sheet papers can be used to print durable maps, forms, instructions, signs, and other documents that can be used outdoors or indoors at any temperature or weather. Select a paper for printing with plain paper copiers, laser printers, or inkjet printers and for writing with a pencil or pen. Use them as blank sheets for sketches or note-taking with one of our field desks. We also sell green and tan "military papers". Compare the properties of the different papers here. Geologists, biologists, engineers, contractors, foresters, and many other professional people use bound books for their field records, forms, maps and sketches. Some need to keep notes on signed, dated, and numbered pages for permanent legal or agency reference. 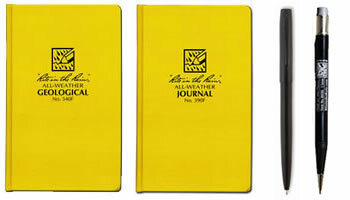 Some people simply enjoy writing or keeping their journal in a bound book. Bound books work with either pens or pencils. Waterproof Pens & Mechanical Pencils Write with waterproof ink or a broad, hard, graphite pencil. 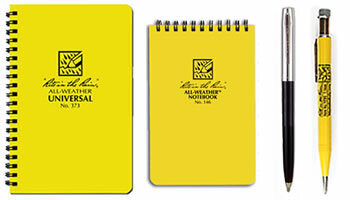 Waterproof Notebooks: Made of durable all-weather materials for use in all climates and conditions. Waterproof Field Books: Four different styles. Hard-cover bound to protect your notes. Storage Clipboard: Light weight field desk / weatherproof storage clipboard. Convenience in the field! 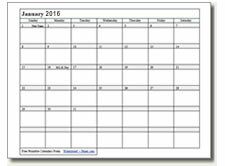 Free Printable Calendars: Plan your schedule. Remember special events with our free calendars. Free Printable Maps: Perfect for students. Teachers can print and distribute for class and homework. 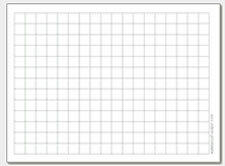 Free Printable Graph Papers: Perfect for math and science teachers, or for professional use. 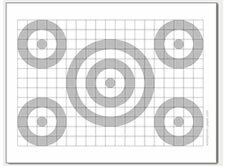 Free Printable Targets: Print as many as you want. Shoot in all weather with waterproof paper. All-Weather Military Paper: Laser printer and copier paper in outdoor green and tan colors. © 2003-2018 WaterproofPaper.com. All Rights Reserved.